Network Rail announced that Story Contracting has won a framework contract to deliver up to £135 million of renewal and enhancement projects in Scotland over the next five years. Glasgow-based Story Scotland — a division of Story Contracting — will help Network Rail complete a wide range of projects on Scotland’s railways, including replacing and refurbishing structures across the route and delivering improvements at stations. The contract has been awarded as Network Rail prepares to invest more than £4 billion in the Scottish network between 2019 and 2024. The deal means Story will recruit up to 60 graduates, trainees and apprentices in Scotland during the five years. 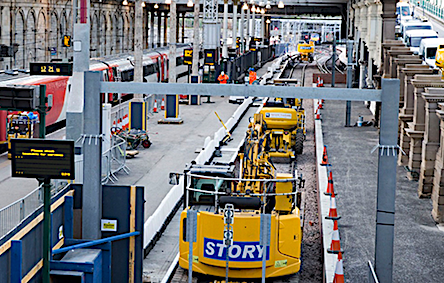 Story is currently working to deliver new platforms at Edinburgh Waverley station. Kris Kinnear, director of Network Rail Infrastructure Projects Scotland, said: “Scotland’s railway plays a vital role in the nation’s economy – keeping millions of passengers on the move each year and providing thousands of jobs across the country. “Our contracts provide suppliers with substantial work-banks and the opportunity to be part of delivering essential improvements that will help shape the future of our rail network and improve reliability for our passengers. John MacArthur, Director of Story Scotland, said: “I am absolutely delighted to win this contract which reflects the collaborative working relationships we have been building with Network Rail and other key clients in Scotland. Story Contracting CEO Jason Butterworth said: “I am delighted for the team in Scotland and particularly because this win is down to our reputation for delivery on site, quality, safety and managing projects on time and to budget.